Abstract. The remaining populations of the endangered dwarf wedgemussel (DWM) (Alasmidonta heterodon) in the upper Delaware River, northeastern USA, were hypothesized to be located in areas of greater-than-normal groundwater discharge to the river. We combined physical (seepage meters, monitoring wells and piezometers), thermal (fiber-optic distributed temperature sensing, infrared, vertical bed-temperature profiling), and geophysical (electromagnetic-induction) methods at several spatial scales to characterize known DWM habitat and explore this hypothesis. 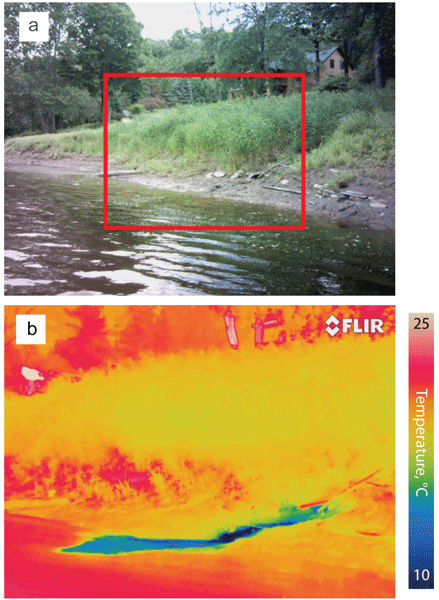 Numerous springs were observed using visible and infrared imaging along the river banks at all three known DWM-populated areas, but not in adjacent areas where DWM were absent. Vertical and lateral groundwater gradients were toward the river along all three DWM-populated reaches, with median upward gradients 3 to 9 times larger than in adjacent reaches. Point-scale seepage-meter measurements indicated that upward seepage across the riverbed was faster and more consistently upward at DWM-populated areas. Discrete and areally distributed riverbed-temperature measurements indicated numerous cold areas of groundwater discharge during warm summer months; all were within areas populated by DWM. Electromagnetic-induction measurements, which may indicate riverbed geology, showed patterning but little correlation between bulk streambed electromagnetic conductivity and areal distribution of DWM. In spite of complexity introduced by hyporheic exchange, multiple lines of research provide strong evidence that DWM are located within or directly downstream of areas of substantial focused groundwater discharge to the river. 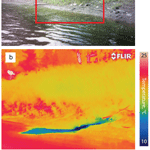 Broad scale thermal-reconnaissance methods (e.g., infrared) may be useful in locating and protecting other currently unknown mussel populations. How to cite: Rosenberry, D. O., Briggs, M. A., Voytek, E. B., and Lane, J. W.: Influence of groundwater on distribution of dwarf wedgemussels (Alasmidonta heterodon) in the upper reaches of the Delaware River, northeastern USA, Hydrol. Earth Syst. Sci., 20, 4323-4339, https://doi.org/10.5194/hess-20-4323-2016, 2016. The remaining populations of the endangered dwarf wedgemussel (DWM) (Alasmidonta heterodon) in the upper Delaware River, northeastern USA, were thought to be located in areas of substantial groundwater discharge to the river. Physical, thermal, and geophysical methods applied at several spatial scales indicate that DWM are located within or directly downstream of areas of substantial groundwater discharge to the river. DWM may depend on groundwater discharge for their survival.